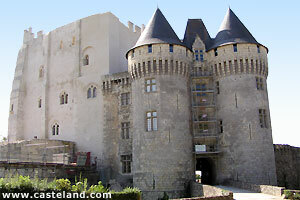 Dominating the Town of Nogent Rotrou, the castle Saint Jean occupies a remarkable site. Located at the end of the plate cut out by Huisne, it overhangs five valleys, as well as the roads of the Mans in Chartres, and of Châteaudun with Bellême. It is thus with a crossroads between the Island of France, Normandy and Maine. Casteland.com particularly thanks the owners for the castle for the History as well as the information on this one.